Interviewer: Can you quickly look back on your 2018? 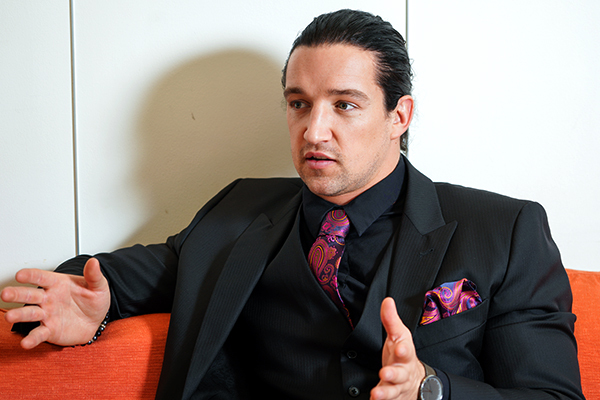 Jay White: I think it’s probably the best year anybody has ever had in wrestling. I don’t think anybody had that kind of impact like I just did. The only thing that some people could compare to is maybe Okada when he came back in 2012. He did great things for himself, but I did great things for myself and for other people just as effects by things I was doing. For example, when I beat Kenny, that put all these things into motion that caused implosion of BULLET CLUB like I said it would happen. You know, Cody turned on him, Ibushi came out and saved him and reunited Golden Lovers. Things like that wouldn’t have happened if I haven’t come back and if I hadn’t done things that I did. So that’s an example of that. You know, Kenny wouldn’t have got a belt from Okada if I hadn’t joined CHAOS and started messing with Okada’s head. So I’ve said a lot of times now I’m still waiting for Kenny to thank me for both of Golden Lovers reunion and his title reign. I beat Kenny Omega, I beat Hiroshi Tanahashi and I beat Kazuchika Okada all within maybe 6 or 7 months. You know, same year in 2018. So my credentials in 2018 speak for themselves. Proof is already right there for everybody to see. You know, the other thing as well, on top or Golden Lovers reuniting, we saw for the first time Tanahashi and Okada team together. Again, that was because of me. If I hadn’t come back and done the things that I’ve done, those two wouldn’t team together, you know. The fans are so excited about that so they can thank me as well even though they lost 7 in a row. We had a clean sweep on the tour, 7 in a row. They still team together, so Golden Lovers reuniting and the supposed New Japan dream team of Tanahashi and Okada wouldn’t have happened without me. Interviewer: How about Togi Makabe? White: Makabe is coming back and I don’t know why he’s helping out Toru Yano and helping out CHAOS whatever, so that’s another thing as well. All those things happened because of me. I’ve done so much in 2018 for wrestling and for this company I’m starting to forget, you know, hard to remember them all. Interviewer: When you came back from the U.S.A., did you expect you would become the center of New Japan? White: Of course. Everyone has, you should have that drive to go and be in that position. I know what I’m with, what I’m capable so of course I knew that I gotta be center of New Japan. 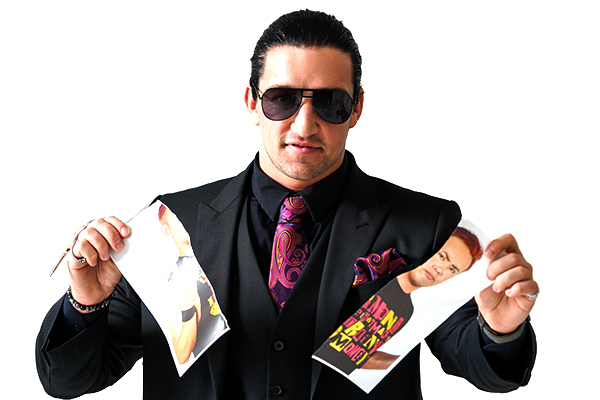 And just like everything else, I always say what I’m gonna do, I’m gonna beat Kenny, destroy BULLET CLUB. BULLET CLUB was none at that time, not the Cutthroat Era of now. Of course, I knew I was gonna do that, I knew I can do that, that’s the whole idea. I don’t just come in and just things don’t accidentally happen. So very intentional for me. Interviewer: Did you plan to deceive Okada when you joined CHAOS? White: When he first brought me in, no. It lasted about 5 minutes. But it wasn’t even CHAOS, it was Okada. First 5 minutes of the press conference, the day after New Year Dash, I had no intention to do things that I’ve done. I told Okada I would come for him. He had the belt at that time and, you know, it didn’t have to be anything personal because he was completely professional, but he laughed me off and said I wasn’t a threat to him. So from that point I decided that I was gonna show him and show everybody cos, you know, he was saying that, this was gonna be people following him and thinking the same, so I decided to show him he was wrong about me being a threat to him. I decided I was gonna take him down, cost him everything, take everything away from him. Not just he lost the belt but he lost the best friend after how many years, 6 or 7 years together? Gedo, he is now in my corner, not his. I beat him at G1 CLIMAX, he wasn’t even in the G1 CLIMAX final and now Tokyo Dome is coming up, I’m gonna beat him on the bigger stage as always at Wrestle Kingdom. So not immediately, but as soon as he laughed, that’s when he sealed his fate. Interviewer: Did you approach Gedo or did Gedo approach you? White: After G1 CLIMAX Gedo approached me. After I beat Okada at G1 CLIMAX, I think he realized, he saw the opportunity. So he came to me about it and I was already on the same page before even he mentioned it. I can tell what he wanted to do. He came to me after I beat Okada at G1 CLIMAX. Interviewer: One of reasons you joined New Japan was your meeting Bad Luck Fale. Was that the main reason you joined BULLET CLUB? White: It just made it easier for that conversation to happen for me to join BULLET CLUB this time because we did have that history. So there has always been that background between us. It made a lot easier for us to talk about and come up with what we did at King of Pro-Wrestling. You know, none of this was because of that, but it certainly made it a lot easier because we knew each other prior to coming to New Japan. Interviewer: Do you feel more comfortable being in BULLET CLUB than in CHAOS? White: Of course. There were conflicting ideas in CHAOS. The way Okada thought things should be done conflicted with how I thought things should be done. In BULLET CLUB, we are all on the same page. We showed that in our matches. I don’t think we’ve lost, I have never lost to anybody especially on the last tour. 7 win in a row against Okada and Tanahashi that shows we are on the same page. There’s no conflicting idea. Before, in CHAOS things were falling apart. You had Yoshi-Hashi getting hit verbally by myself and Okada getting hit sometimes in matches, people colliding. We were on the different page. 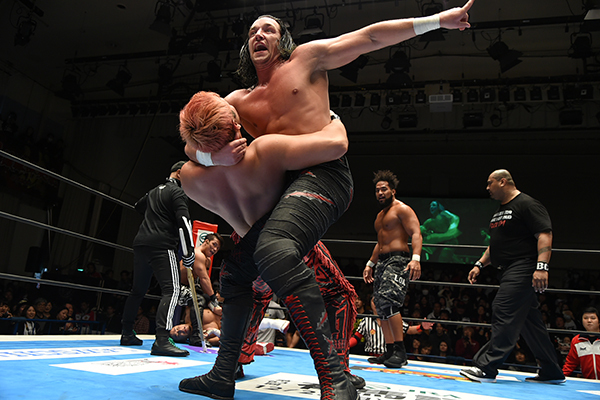 I had to go through the whole G1 CLIMAX tour in those tag matches having YOH just not listen so he kept paying the price every single time. He just needed to listen to me. BULLET CLUB doesn’t need to be told like CHAOS guys did because we are on the same page, we have the same ideas so everything happens very naturally and easily. Interviewer: ROPPINGI 3K from CHAOS were your mates from your days in New Japan Dojo. Do you have anything to say about them? White: You know, they took a different path. They chose different things. We grew up in terms of wrestling in New Japan Dojo together. I tried to help them at G1 CLIMAX. I think there was a point when SHO made a scene. I think of comments he made. He said he may not agree with my style but I’m right. I get the job done so maybe he should consider that. What they wanna do is up to them. It doesn’t hold me back if they don’t do well. They are only gonna hold themselves back if they don’t wanna listen to me. So, you know, chances for them are gone now. Interviewer: You were babyface who fans loved. What made you change? White: I don’t know if fans loved me. They liked me a bit, but it’s never gonna be, you know, as a foreigner, fans never gonna get behind you as much as they do for Japanese wrestlers. That’s how it is and, you know, instead of trying to fight that, I just gave them what they wanted. If they are gonna like me, that’s fine, but, at the same time, it’s not about them. That makes sense, but it’s more about what works for me. If I have to worry about playing up to the fans and getting them to like me, that’s not a thing I have to be thinking about and working on. What I just worry about and work on is winning and getting the result in the ring. That’s what is gonna give me the success. I don’t care if they like me or not because that is no more on my mind. Also, when you follow all these regulations and rules and maybe your elder, things like that are more way on my shoulder. I don’t need it so I look up to myself and, as a part of that, look at me, I’m in BULLET CLUB now. That works the best for me. Interviewer: Do you remember you said you wanted to be foreigner version of Tanahashi when you were a Young Lion? White: Yea, but, you know, like I said, as Young Lion I was young and naive. I’ve matured a lot and smartened up since then. You know, I was a bit of dumb kid at that point, didn’t quite realize maybe what was the best for me. What I do now evidently shows that the choice has been made since then. So yeah, people say things and sometimes they are wrong, and also people change, change their minds. Interviewer: Okada achieved 12 consecutive defenses as IWGP heavyweight champion. How do you rate him as a wrestler? White: I know he is good. I don’t dispute him being good. I’ve been in the ring with him as well and upset him so many times now and also was on the same side so, yeah, I know he is good but I just know I’m better. When he defended that belt 12 times, none of those defenses was against me. Interviewer: When you joined New Japan, Okada was already an established face of the company. Now you are going to face him at Tokyo Dome. How do you feel about it? White: It’s no surprise to me. It’s not extra big deal or anything. It’s what I knew that would happen. And, you know, it’s a big show but in terms for me mentally, I beat Okada in tag matches and in one on one, so I know I can do it again. It’s just another time when I leave him in the ring. It’s not a thing that get me overwhelmed about it one, because I know I can beat him and, two, I know where I will be. Interviewer: Your first match with Okada was at the opening night of G1 CLIMAX and you won that gave fans huge impression. How do you think of it now when you look back on it? 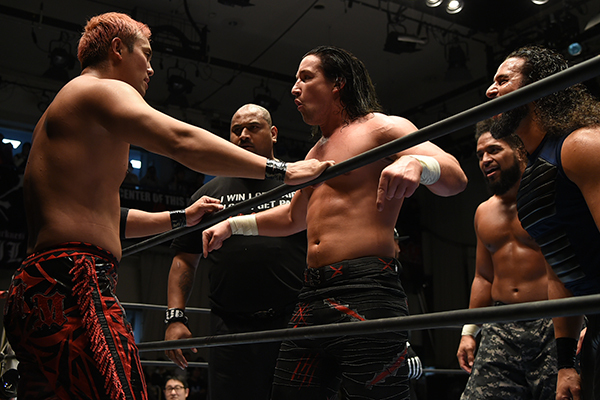 White: It opened a lot of people’s eyes, both fans’ and especially Okada’s eyes to me being a serious threat to him which prior to that he didn’t think. He didn’t think I was a threat. I know it surprised him and fans and as I said, it was what I knew I could do and I knew would happen. It’s just the case of other people realizing and believing it, too so I think it was the big point when fans, Okada and everybody realized maybe they should take me seriously. Interviewer: You defeated Okada by low blow that some fans complained about. Do you care about it? White: (laughing) No. Not at all. Why do I care about how someone sitting down in the crowd thinks how I won? I won. I got the point of that match. I beat Okada. That’s all that matters. It doesn’t matter how I do it. They can complain all they want that doesn’t change the fact that I beat him. Interviewer: Okada has experience of headlining Wrestle Kingdom so many times. Is it a threat for you? White: No because, if that played a part, then maybe he wouldn’t have lost at G 1. And maybe him and Tanahashi together with experience so great, then Tanahashi and Okada together as a tag team would made them beat us, but they didn’t. So I think it already showed the answer to the question. No, that’s not a threat. And I have Gedo on my corner. He’s been doing that stuff for 30 years. Look at what he did for Okada. He’s the future maker. Now I have him in my corner to combat that experience. But it’s not an issue for me. The pressure here is on Okada, it’s not on me. Pressure is on him because, like he said, he’s in this position that he’s been before on this big stage, but he’s the one that would surprisingly lose because he is expected to win. People expect him to win. I keep beating him so pressure is on him, not me. Interviewer: Your first time at Wrestle Kingdom was when you started in New Japan. When you came back from the U.S.A., your first proper match was at Wrestle Kingdom, too. 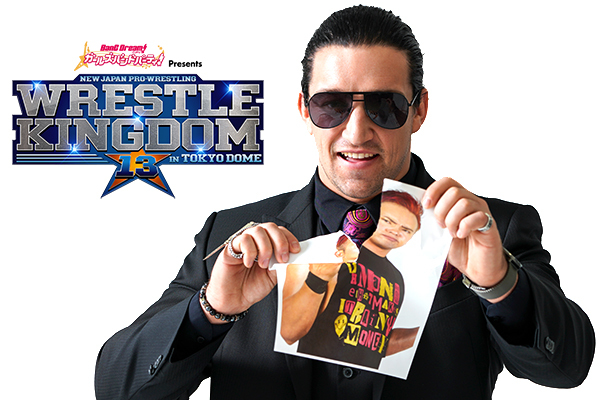 Do you have any special feeling to Wrestle Kingdom? Is Tokyo Dome your favorite venue? White: Not really. Sure, it’s a bigger event. It’s just another opportunity to showcase ourselves to a lot of people. But, like I said, I’m not worried about what the other people think. No matter how many of them are watching, I’ll show them that I’m not lying, show them that I’m better than Okada because I said the whole time people won’t believe it, so I can’t wait to rub people’s face at Tokyo Dome. No, it doesn’t hold a special place in my heart. Interviewer: When you defeated Okada, you used Blade Runner for the pin. Where did Blade Runner come from? White: It came from Alex Shelley. It’s a move that he used to use called Shell Shock. Toward the end of 2017, I started to use it and when I came back that’s when I did it to Tanahashi in Osaka at the end of 2017. It came from Alex Shelley. Interviewer: How do you want your Wrestle Kingdom match to be? Do you have a message to Okada? White: I want it to be me winning. That’s it, you know. I mentioned it before, Kenny and Tanahashi have got so worried about how the fans think about all these ideas behind everything. People get too wrapped up around it. If Okada does think like that, then it’s gonna cost him. I’m gonna beat him in many ways, but it would make it much easier for me. If he cares about fans…he said at press conference something about it. He feels like he needs to carry this match so I take it as he thinks that he’s gonna beat me so easily that he needs to find a way to entertain these fans because he doesn’t think that it’s gonna be a competitive match. But it’s so funny that he said that because, I don’t know what he’s basing that knowledge on. I beat him. I beat him before. I just keep repeating myself, the same noise is coming from my mouth. I always beat Okada in the ring every single time. The same thing is gonna happen again. So he worries about what the fans think, if the match is exciting for people. He’s gotta lose again and I’m fine with that because it makes it much easier for me. I don’t care about what people think of the match. What I care about is at the end of match in the ring, it’s me standing tall, him lying on the ground, my hands held high. I will be the winner. That’s what I care about. My message to Okada is make sure you focus on me, don’t worry about the fans, what the fans think about you or what the fans think about your match. That’s not what matters, it’s gonna be me and him in the ring. He needs to focus on me. If he wants to stand a chance, he needs to stop overlooking me. That’s my gift to him. You know, I shouldn’t really give that away. It’s gonna help his game plan because it hasn’t been working since. So maybe he should listen to me and maybe, maybe he will make it past 10 minute mark with me. We’ll see. That’s my message to Okada. Focus on me. Nothing else. Don’t overlook me cos I’m gonna beat you again.